I don’t talk about my big career move on a daily basis. And I sure don’t mention my two years at the bank, because that was a very dark period for me. Honestly, I don’t like to get started on the subject, because it brings back so many bad memories. However, today I got into two conversations today with people who had ties to the bank. They started to ask about my story. I could just tell that that sinking feeling was sitting with me. I remembered having to walk four blocks to my building (and I was paying about $60 in parking a month). On the really bad days, would sometimes leave on my lunch break, walk my four blocks, JUST so I could get to my apartment for some distance. I would turn on Ellen and escape for a while. If I couldn’t wait until lunch, I’d go up to the women’s restroom on the 9th floor to cry. I remember thinking “what is next?” I didn’t have an answer. I didn’t know what was my next “career goal.” I sure didn’t think I could do anything I wanted to. I just had a Public Relations degree with a few years of experience in writing sales promotions for mid-sized bank. That is not a lot to go on. As a kid, I would tell people I wanted to be a star on Broadway. In high school, I wanted to star on the Broadway version of Hello Dolly! I wanted to just glide down the staircase in a glamourous dress singing my heart out. But I didn’t have the voice. I had a really good voice, but not Broadway worthy. On the Ellen Show, she would always talk about how you only got one shot at life, and if you weren’t doing what you love, then what were you doing! And I didn’t know what I was doing. When I say I didn’t have any sort of art training, I really mean it. You can ask my mom. After sixth grade, I never took an art class. I didn’t draw, doodle, NOTHING. I had the worst handwriting known to man. But I loved colors. I loved design. I also had an extensive collection of stationery that started when I was six. I always got excited when the Martha Stewart Christmas wrapping paper was released at KMart. And I got really really excited about Starbucks Christmas designs each year. I still have several of the drink wraps that I just thought were fabulous. I collected cool brochures. I held onto neat paper. I bookmarked design firms, illustrators, and photographers. I loved patterns, colors, and just all things fabulous, but I sure didn’t know how to make any of it. I had taught myself a few things in Photoshop in Illustrator. And I had Photoshop on my computer at the bank. February 2007 is when I really started to ask myself some hard questions. What is your career goal? I had no clue. So then I started to ask myself some basic questions. What do you want to do when you retire? What do you want to be when you grow up? What do you love? What excites you? What comes naturally? What do you enjoy doing? By June, I realized graphic design is what I loved. So how in the world was I going to get a job doing it. It was either pray that someone would hire me with NO experience, or I could go back to school. In mid-July I decided to go to Mississippi State University. 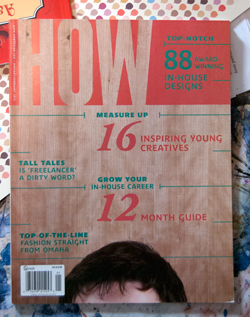 In the January issue of HOW Magazine, I was selected as one of the 16 Inspiring Young Creatives in 2012. Words can’t express how shocked and humbled I am about that kind of recognition. There has been one other Mississippi State graduate to receive this and that is the AMAZING Will Bryant. It’s days like today that I look back and realize how far I have come. My mother was seriously worried that I was going to fail Drawing I. I was very terrified, too! I had NO clue if I could learn how to draw. I had NO clue how any of this would turn out. Never in my dreams could I have envisioned any of this. Now, I have to push myself out there. Way out. And I am not going to stop. Because you DO only get once chance at this. 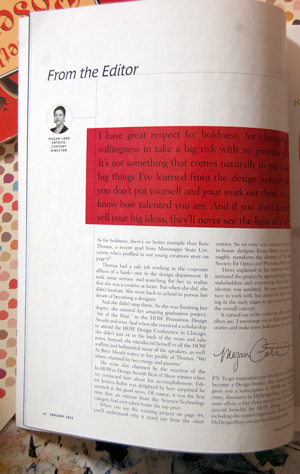 And in this same issue of HOW, the Content Director, Megan Lane Patrick, talks about ME in the editor’s letter. “I have great respect for boldness, for chutzpah, for the willingness to take a big risk with no promise of reward. It’s not something that comes naturally to me. One of the big things I’ve learned from the design industry is that if you don’t put yourself and your work out there, no one will know how talented you are. And if you don’t learn how to sell your big ideas, they’ll never see the light of day. 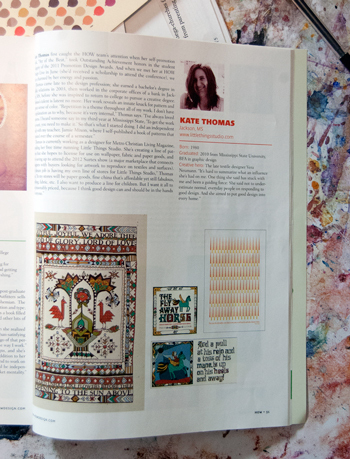 As for boldness, there’s no better example than Kate Thomas, a recent graduate of Mississippi State University who’s profiled in our young creatives story on page 87. I am very thankful and very blessed. I met Will Bryant at the Austin Renegade Craft Fair in 2010, and I met you at the same fair in 2011! I so appreciate your story, and I think about it often! Congratulations on all your success! Thanks so much for sharing your story! It’s powerful — helps others to be bold, too. “take a big risk with no promise of reward” — that’s huge. Also, love your work and your blog. So glad you’re following your heart. wow. the exact questions i am asking myself at the moment. very powerful. thanks for sharing. You are crazy talented and it’s a huge encouragement to see how you’ve worked and persevered to use those talents for good. I love you a whole lot and am so thankful to know you! Enjoyed reading your inspiring story! What can I say other than I am so proud of you, and I am so lucky to have you as a roommate. You are so inspiring and I know the Lord brings people in and out of our lives for specific reasons, you being one of those brought into mine. Congrats on all your successes and can’t wait to see what is in the year and years to come for you, dear friend.